Whooooaaaaah I hear you yell - two posts in one day!!!! Will it snow tomorrow???? Well I told you I was getting my craft on! I have made a few promises to myself since returning to convention- one I have already mentioned- that I will get an award at next year's convention. 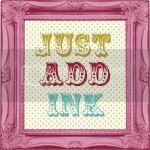 The other is to spend more time stamping for myself and not just for my inkyloulou business. Before I went away the only stamping I was doing was for cards, etc that people had ordered and as much as I LOVE doing that I also think it is important to do some things just for me. One of my favourite things has been entering the Just-Add-Ink Challenges and for far too many week's I just didn't find the time to enter anything. Soooo here I am back stamping for myself and entering JAI Challenge 19. Well that is all from me tonight- it's late. It's going to be a lovely, sunny day in Perth tomorrow so Elliot and I are going to meet some friends we haven't seen for a long while at the park. Before I go though I almost forgot to show you these photos I took today of my little darling doing some stamping of his own. How cute is that?!?!?! Glad you are back Lou, that is bewdiful!!! Just makes you want to drive right into and pick all the flowers. Such a fun, vibrant card. Love it! Holey-smoley - this is amazing! Do I even recognise that bird! You've done an outstanding creation! Welcome back! A bright and happy card. I love how you have cut out colour for the birds head. I just love how vivid this card is - it is AMAZING!! Great job (and the second photo of your little cherub is just too cute)! Gorgeous card! I love the colours. Nope.. don't like it... LOVE IT!!!! Lou... You've take a REALLY bright combo and made it absolutely STUNNING!!!! I REALLY LOVE it!!! LOve the pics of your little man stampin' too... SOOOO sweet. And he looks like he's having a ball. Hope we can catch up soon. I know that paper anywhere - from IKEA? 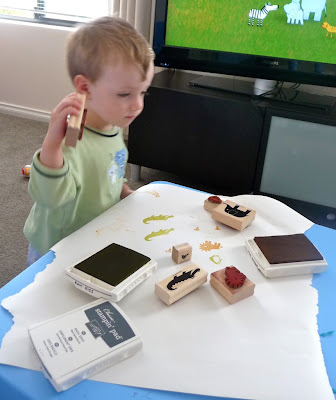 It's perfect for little people that need to do some stamping (puh-lenty of space!)! heehee. 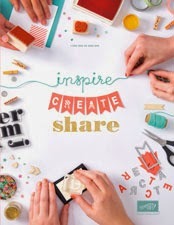 Beautiful project Louise! Nice card Louise, Well done! So much attention to detail in this gorgeous card, it's a real stunner! Congrats on top 5 pick.